This year I am going to challenge myself to decorate my Christmas tree with second hand items I find thrifting. Since I find a LOT of kitchen utensils and kitchenware, it's likely a lot of my repurposed ornaments will be made from utensils. 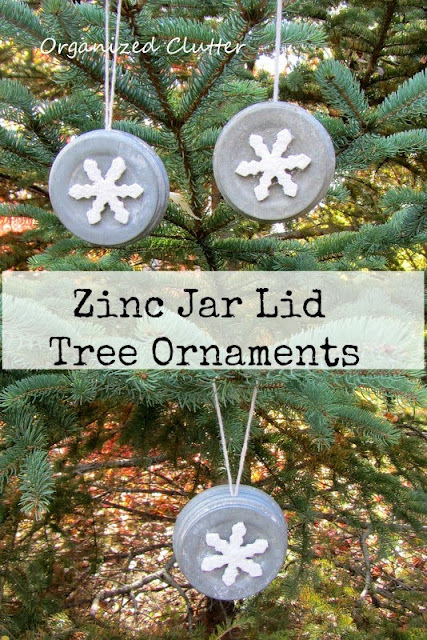 I have already posted the zinc jar lids here. They will be the first repurposed tree decorations. Today's project will be made from repurposed silverplate teaspoons. As you can see I have drilled holes in the handle tops, and in the points of the spoons. I have also cut sheet music ovals that fit in the spoons. I used Mod Podge on my finger to put glue on the top and bottom of the sheet music cut outs, and centered them on the spoons. Try to carefully work out any ripples in the paper. Next I put a small jingle bell on a jewelry ring to attach to the bottom holes on the spoons. I threaded a thin white ribbon through the hole in the handle and tied it in a knot. Spoons are easy to find, inexpensive, and these were easy to make. I'm going with "less is more", and keeping them simple. Repurposed Christmas Tree Ornaments # 2 - Teaspoons! How cute and very clever! 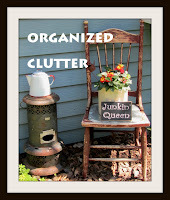 I am looking forward to seeing your tree with all re-purposed ornaments! I love these, Carlene! What did you use to make the holes? You so inspire me! Your ideas are just fantastic. Great ornaments, and so creative. They look wonderful on your outdoor tree. What a great idea. I love this. Repurposing thrift finds into ornaments genius!!! Your teaspoon ornaments would be cute with baby silverware as a baby's first Christmas ornament, too! Very cute. Love the jingle bells added to the bottom. Very cute! I can't wait to see. Oh I really like these Carlene and I have some spoons!! These are just too cute Carlene!!! I love this idea. 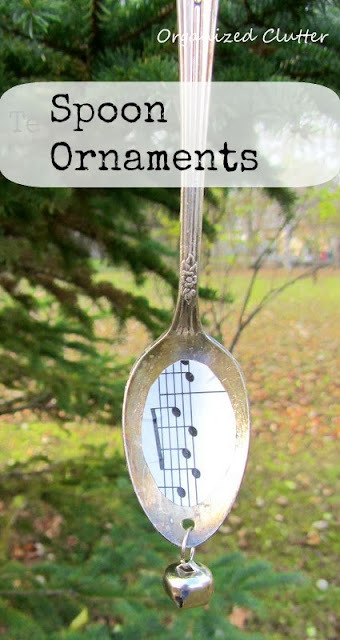 Carlene ... the spoons will be really cute on your tree. Good idea. Anxious to see the decorated tree. Can't wait to see it when it all comes together Carlene! I think instead of using sheet music, that it would be good idea to use old Christmas wrapping paper. The sheet music is nice but it's plain and not very colorful. You could use the wrapping paper with music printed on it, if you wanted music. Thanks for the ideas!